Home / News / Our NEW Mighty Mini Meal Packs Prehistoric Power! Did your kids love collecting the amazing Ooshies at Muffin Break? 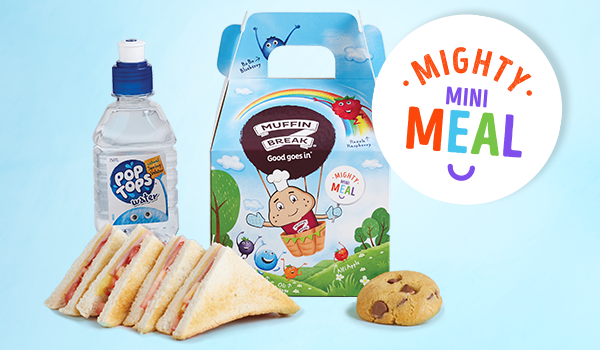 Well, fear not – the NEW Mighty Mini Meal comes with some serious collectible clout! They can now collect their dinosaur heroes from the latest Jurassic World movie. To celebrate the Home Entertainment release of the 2018 smash hit Jurassic World: Fallen Kingdom, we’ve teamed up with the gang at Universal to make your next shopping trip an action-packed adventure. Kids can collect all four dinosaur stars from the movie. There’s Blue, Stiggy Indo Raptor and – of course – T.Rex! Jurassic World: Fallen Kingdom was a global box office success earlier this year. Each of the collectible dinosaurs has a distinct personality, from Blue the courageous velociraptor, to the carnivorous T.Rex! Like to keep the fun going at home? The movie is now out on Blu-ray ™, DVD and Digital. Buy a 4-pack of your favourite muffins and receive 10% Off the DVD at Big W! As most parents can vouch for, it can be challenging to find good, easy options for kids that don’t break the bank. If you’re out and about with hungry, grumbly kids, we’re here to save the day. – A Pop-top. All Pop-tops are at least 30% fruit and come in a variety of flavours. – A NEW Jurassic World keyring! It’s a meal box that packs personality in every way. The colourful Pop-Tops also have unique identities, which are drawn on the colourful packaging. From Wiggi Water to Razzle Raspberry, the Mighty Mini Meal is a fun and interactive way for kids to learn about different personality types. Plus, each box contains a voucher code to enter a competition to win a trip to Universal Studios Hollywood in LA! Find out more here. ©2018 Universal Studios. All Rights Reserved. Ready for your adventure into the Jurassic world? Locate your local Muffin Break store now!